This course offers you an invaluable opportunity to focus entirely on your upcoming eighth grade school year in five full days brimming with discussions, presentations, practical activities, and the arts. With the insights of anthroposophy, gleaned through a daily look at child development focusing specifically on your class’s age group, you will get to know the eighth grader in depth as they stand at the point of inner revolution. Under the guidance of three master teachers, you’ll discover ways to enliven your teaching and how to approach the blocks so that they may meet the eighth grader in a deep and meaningful way. There will be time and space to consider and hone your skills in such practical matters as main lesson books, block planning, projects and activities, and classroom management. These subjects will be supported by explorations in art, movement, and singing, giving you practical tools to take into your school year. Calisa Tucker (Lead) is on sabbatical from the Rudolf Steiner School of Ann Arbor, where she most recently graduated her second eighth grade class and is currently a teacher mentor. Calisa has been a class teacher at her school since 2002. Her first class, which she taught from second through eighth grade, completed their eighth grade year in 2010. Prior to becoming a Waldorf teacher, Calisa worked on an Organizational Learning and Lean Manufacturing internal consulting team for Ford Motor Company. Lessons learned in the automotive industry inspired her to seek out an education that nurtured systems thinking, creativity, and a love of learning. In 1999, during her Montessori teacher training, Calisa rediscovered Waldorf Education; after completing her Montessori training, she completed her Waldorf teacher education at the Waldorf Institute of Southeast Michigan. Calisa earned her bachelor’s and master’s degrees in industrial and operations engineering from the University of Michigan. She enjoys backpacking, traveling, and watching high school sporting competitions. Elizabeth Hall (Lead Support) is currently the seventh grade class teacher at Green Meadow Waldorf School. This is the fourth class of middle schoolers Liz has led at Green Meadow since joining their faculty in 2006, including taking four eighth grade classes; she also serves on the school’s Collegium. A full-time class teacher since 1998, Liz has been involved with home schooling, tutoring, and working with children with special needs in Waldorf environments since 1992. Prior to joining Green Meadow, she was a class teacher and lower school chair at the Waldorf School of Baltimore. 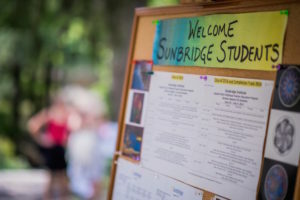 She also teaches humanities and science classes, and anthroposophical studies, in Sunbridge’s Waldorf Elementary and Early Childhood Teacher Education programs, respectively, and speaks at local and international conferences on Waldorf Education and child development. Liz holds a BA from Earlham College, where she double-majored in English and Spanish and minored in art history; an MA in education and a Waldorf certificate 1-8 from Antioch New England; and a certificate of curative education from Camphill Special Schools, Inc.